Lansky Knife Sharpener Mounting Systems give you the option of sharpening large knives, or numerous knives in a row (just wait until your friends and neighbors find out you can sharpen knives-they will be lining up at your door!). Each Lansky Knife Sharpener Mount has Lansky's patented pin and post design for easy 360 degree rotation. 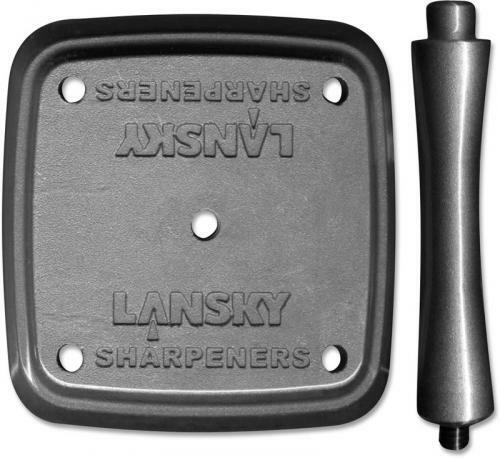 The model illustrated is the Lansky Knife Sharpener Universal Mount. This model is made of lightweight aluminum, and can be disassembled to fit inside your Lansky Knife Sharpener storage case (the base lies flat over the sharpening hones, and the post snuggles in between the clamp and the hones). The base is pre-drilled for optional mounting to table or work bench.